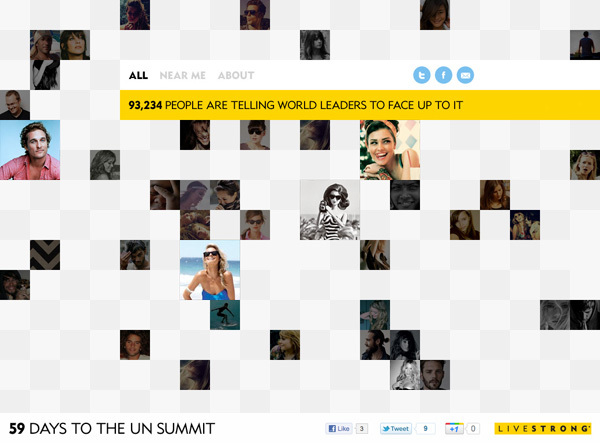 A visual petition spanning a bespoke Facebook page tab, a Facebook app and a separate website, all inviting the public to "add your face", in the countdown to a UN summit… Telling world leaders to 'face up to' life threatening diseases. The users' photos make up a mosaic of thousands of other petitioners, which can be explored and shared. Cancer is a global crisis! 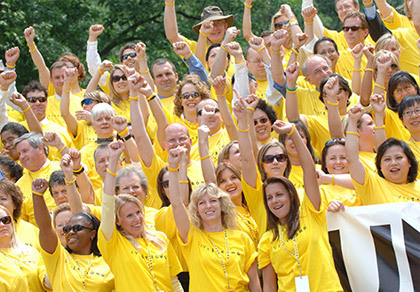 Join LIVESTRONG in telling world leaders to 'Face Up To It'. 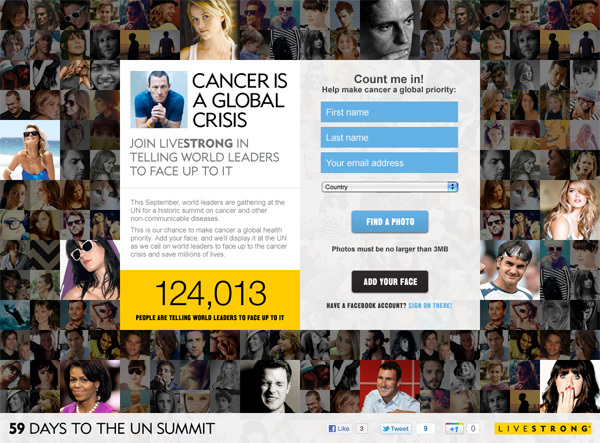 This September's (2011) historic UN summit is our chance to make cancer a global health priority! 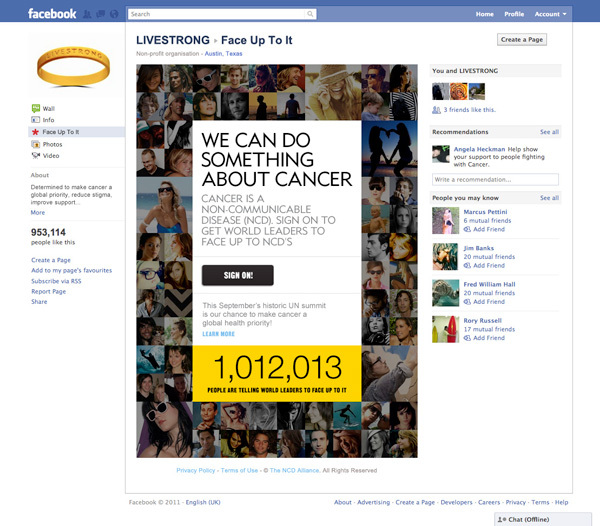 Primarily the campaign is Facebook based, but there is a supporting website too for people without Facebook accounts. 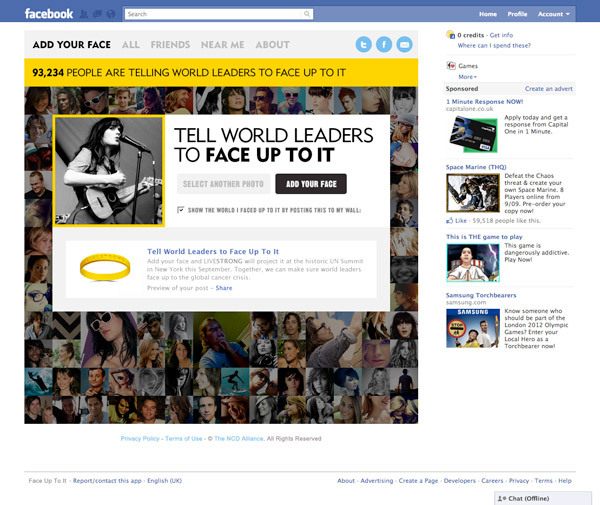 The journey starts as a Facebook tab, introducing the visual petition and inviting you to 'sign it'. Clicking the "sign on!" 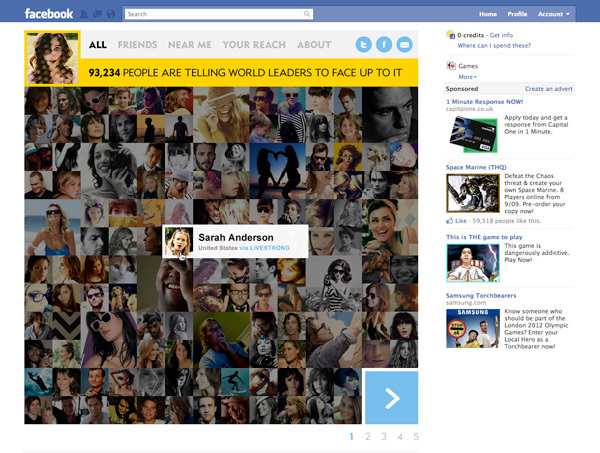 button takes you through to a Facebook app (see next template). You'll see in the first two screens on the MacBook visual above that the app can be easily skinned to fit any other cancer charity, to increase the reach of the petition. The opening screen of the app. The whole process is incredibly simple! Thanks to the Facebook API we don't need to burden the user with filling in any forms, to get this far they have already agreed to let the app access their account and information (as with all FB apps). By default the app pulls in your current Facebook profile picture. But you can choose to use a different photo... after all, thousands of people are going to see your photo! 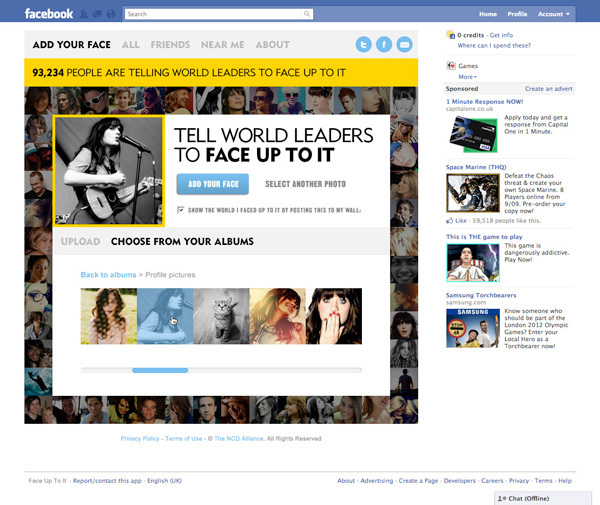 The app accesses your photos and displays all your Facebook photo albums. You can open each album and find a photo (see next template), or upload a new photo. 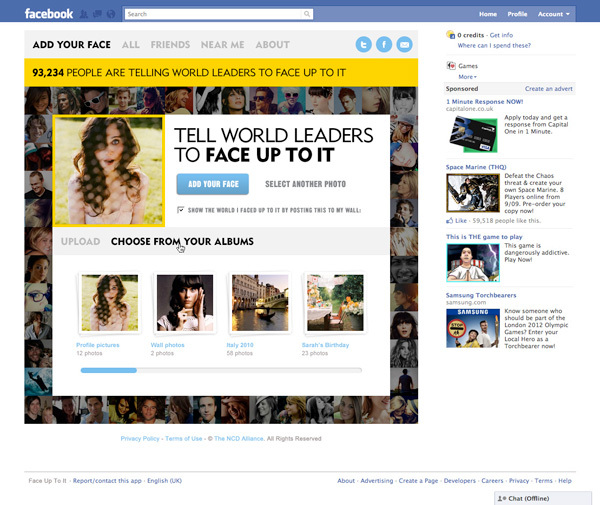 Choose the photo you want to use and click the "Add your face" button, and that's it! After signing the petition you are encouraged to share that you have done so with your Facebook friends, real friends, family and on Twitter. 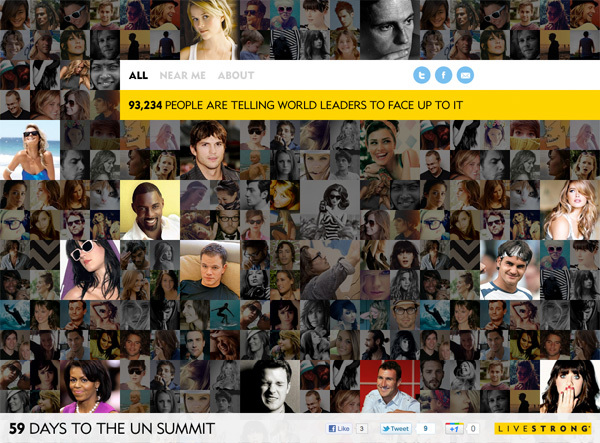 Celebrity petitionees are larger and brighter than the general public's thumbnails to highlight their support of the campaign. Now you've 'signed' the petition you can explore the mosaic. Rolling over thumbnails reveals more about that person. 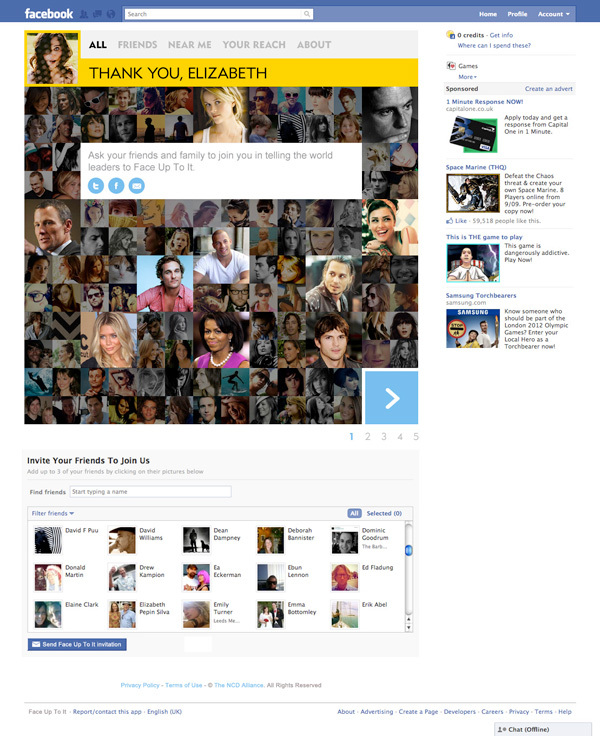 There is a separate website for people without a Facebook account. The functionality is a little different this time, in that, without the Facebook API and access to the user's personal details, we need to collect their details as well as their photo. 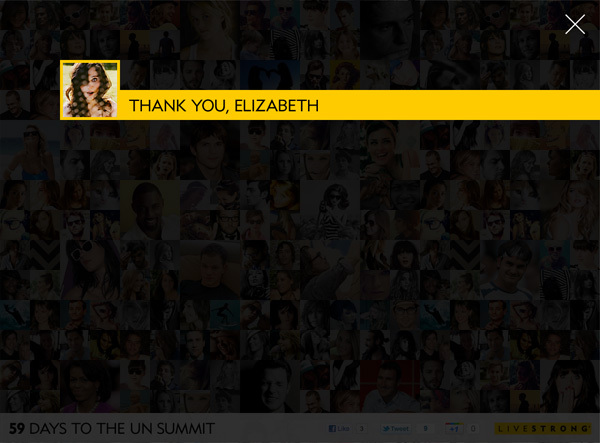 So the user fills in a simple form and uploads their photo to sign!